Artistic Levels A & B (vault, single bar, wide beam, floor exercise). Artistic Levels A & B are co-ed competitions geared towards athletes who are just starting gymnastics, or are more successful at the fundamentals of gymnastics skills. Athletes may compete in all events offered (All Around) or may be Specialists, competing in one, two, or more events (but not all events). SONC Summer Games will be held May 31 – June 1, 2019, in Raleigh. USA Gymnastics and Special Olympics, Inc. have partnered to offer the USA Gymnastics Special Olympics Championships held each year in Georgia in early May. Details regarding this event will be made available at a later date. 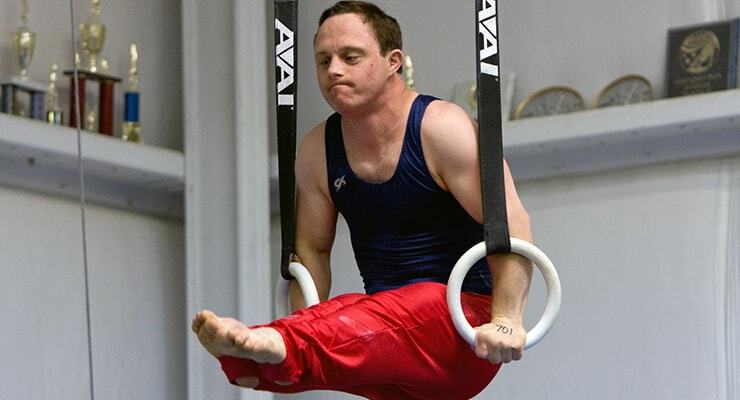 About Gymnastics: Athlete participation has grown in recent years, and this sport continues to be a staple of Special Olympics North Carolina Summer Games. History: Special Olympics North Carolina began offering gymnastics competition in 1986. Six athletes from Special Olympics North Carolina attended the 1991 International Summer Special Olympics Games in Minneapolis, MN. Gymnastics was the first Special Olympics North Carolina sport to offer weekend training camps in 1991 just for coaches.